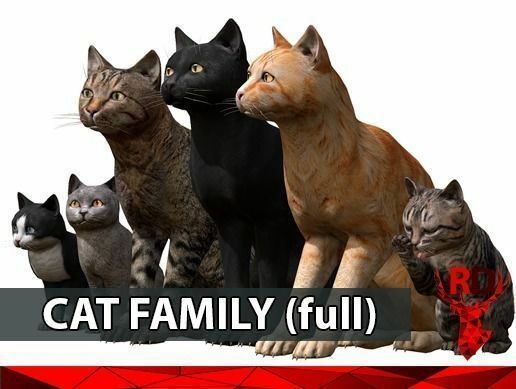 This pack has realistic CAT FAMILY. There is a version for mobile phones with 970 triangles. Texture maps - albedo, metallic / roughness, normal map (all 4k). There is a version for mobile phones with 1070 triangles. Agression, attack 1-4, hit front, hit back, hit middle, hit agress, death 1-3, caress (sit, lie, idle), idle 1-3, eat, drink, lie, sit, sit idle 1-2, sit-lie, sleep, crouch (f-b-l-r), walk (f-b-l-r), trot(f-b-l-r), run(f-b-l-r), walk back (l-r), fear, jump, jump run, jump trot, jump down, jump up, hide, hide rotate (l-r), swim idle, swim (f-b-l-r), etc. Can be used for animation ? Good stuff. Hope to see more cat stuff from you!